An adult grasshopper. Its front and middle pairs of legs are for walking, and the powerful hind legs (with the herringbone pattern) are for hopping. Adults have wings that are about as long as their body. This grasshopper is “short-horned” because its antennae are only about half as long as its body. “Long-horned” grasshoppers have much longer antennae. As you walk a sunny dirt or sandy trail in August, you might seem to be kicking up butterflies as you go. Near your feet, insects with black wings edged in light yellow suddenly fly up, flutter several yards ahead, land, and disappear. Are they really butterflies? No, as it turns out, they’re one common kind of grasshopper (Dissosteira carolina). These particular grasshopper males are displaying themselves as they court females. Most grasshoppers are well camouflaged by their green, gray, or brown color and also are not as conspicuous in flight as these are. We have several kinds of grasshopper in our area. 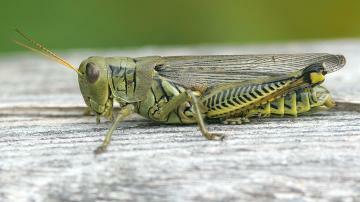 Even if you don’t see grasshoppers, you might hear them, whether you realize it or not. August is full of insect songs, day and night, as various insects – katydids, cicadas, crickets, grasshoppers – make their characteristic sounds as they go about finding and courting mates. Grasshoppers usually sing during the day. Their song has a mechanical sound, like soft, fast clicking or buzzing. Most make their sound by rubbing the inside of a hind leg against a forewing. The leg has a set of pegs which get rubbed against the wing, creating vibrations or clicks. This works somewhat like running the teeth of a comb against a fingernail. Some other grasshoppers make a crackling sound by clapping their hind wings together as they fly. When it comes to hearing each other’s sounds, grasshoppers use organs located not on their heads but on their body (more exactly, on their abdomen). Their hearing organ is basically a membrane that vibrates with sound waves, somewhat as our own ear drum does. In late summer or fall, female grasshoppers lay eggs in the ground, where the eggs overwinter. Typically the eggs are laid in small packets of 10 to 20. In the spring, young grasshoppers, or nymphs, hatch and mature in about 60 days. The nymphs look similar to adults, so you’d probably recognize one as a grasshopper. As they get larger, they outgrow their old “skins” – actually exterior skeletons – and shed them about 5 times. The nymphs gradually grow wings, which lengthen until they are about as long as the grasshopper’s body at adulthood. The nymphs also become reproductively mature. Grasshoppers are sometimes familiar to us from biology classes, where they are often studied as examples of insects. (They’re also used in scientific research.) Grasshoppers don’t have lungs like we do, but instead take in oxygen and give off carbon dioxide through air-filled tubes running throughout their body. Grasshoppers have green “blood” – a body fluid that brings nutrients (but not oxygen) to all parts of the body, including the wings, and picks up wastes for removal. Their external skeleton is made primarily of chitin, a carbohydrate common in insects (and fungi such as mushrooms). Grasshoppers feed on plants, especially grasses and leaves. A few kinds of grasshopper are the “locusts” that are known to be able to switch from leading solitary lives to gathering into large swarms that wander the landscape and eat every plant in sight. In these species (none local), this change in behavior is believed to be a response to crowding. Of course, grasshoppers themselves are part of the food chain. Birds eat grasshoppers, which are a good source of protein for them. Other animals, such as foxes, skunks, and garter snakes, also catch and eat grasshoppers. (If you have a cat that goes outdoors, you may have seen your cat go after one.) In many parts of the world other than the U.S. and Europe, grasshoppers are even familiar to people as food. Tourists may be surprised to find street vendors selling grasshoppers. These insects can serve as a snack food, a delicacy, and a source of protein. As this season nears its end, enjoy the insect songs of late summer. Look around and you might glimpse a grasshopper. While you’re outside, remember that August is also a time of beginnings – a month for spotting baby snakes and baby turtles on the ground.